CAUTION: This project deals with hazardous voltage with the risk of death or personal injury! Please don't do anything unless you are absolutely sure of what you are doing. There is no one liable for the correctness or usage of any information below. Discussion, work and various projects have been done or are still going on regarding powering our MySensor/Arduino projects from mains supply. So I think the interest in these projects are pretty high. For this reason I decided to share this project as "work in progress" even though I prefer more completeness before publishing. The prototype PCB needs a couple of minor modifications to work. I only share Kicad design files without Gerbers to make sure anyone doesn't order it without being aware of the necessary mods. What I do like most: (1) Cheap (2) Good range. (3) Low power. (4). Small size. My first idea was to reuse as much as possible and MySensorize one of these common commercial wall-plugs. I did a few tries reusing some parts of the hardware (PCB and power supply) and squeeze in an Arduino Pro Mini and nRF24L01. I failed. 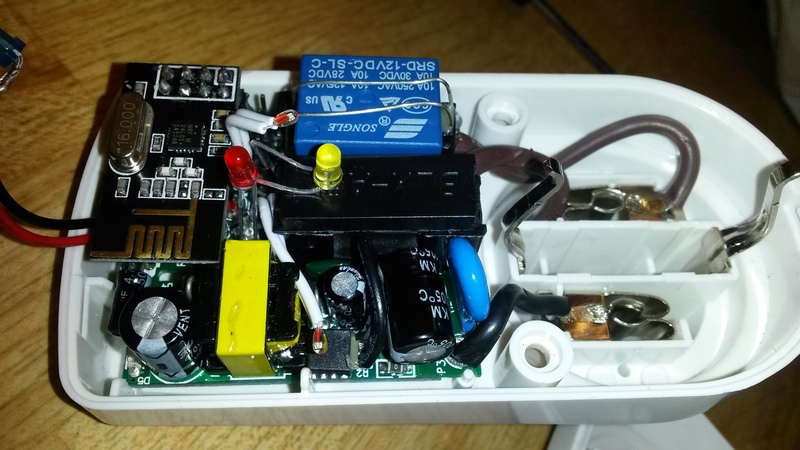 The available power wasn't enough because of the relay and when I upgraded the transformerless supply it became to big to fit in the original enclosure. Thus, I looked for a switching transformer supply instead. Transformerless supplies are great for low power class II devices like this since they're completely insulated. A transformer (-based switch mode-) supply is better for class III devices where the secondary voltage is touchable. But, in this case I had to go for transformer supply because of the space. I can see disadvantages with this choice; (1) Safety - It's much more complex and when ordering from China I'd prefer to trust a single X-cap rather than a whole power supply assembly. (2) Cost - (Not really, because it isn't as great difference as it used to be. Especially considering the work effort with more components of you build a transformerless supply from scratch.). To make it easy to design and useful for other future projects as well, I looked for a smaller switched mode power supply (SMPS) than the famous HLK-PM01 and then I had to do my own little review of it in this thread.. I went to a local shop and bought the cheapest 3-pack I could find, six months ago. I can't find it at that price (99SEK) any more, but the enclosure is (the most?) common, used by different brands and I guess very available in general. In worst case my new hardware of this project could be redesigned to fit other enclosures. The internal parts of the original product is like every other of these: Xcap-rectifier-filter, relay, tiny uC with eeprom, radio circuit, etc. Note all the unused space inside the enclosure. Yum yum. Since I don't have the right triangular shaped tool to release the two screws holding the case halves together, I replaced them as soon as I released them (with a normal flat headed screwdriver of the right size). I found that the screws included in the 10pcs Magnetic Door Switch Sensors make a perfect replacement for these. Here's my initial requirements. It's important to know that the objective of this first design was to (1) Be safe and (2) Collect info enough to assess reliability. It was not intended to be a final version. Standard 5x20mm glass fuse. Proven, high breaking capacity, replaceable and flexible (e.g. testing different values). 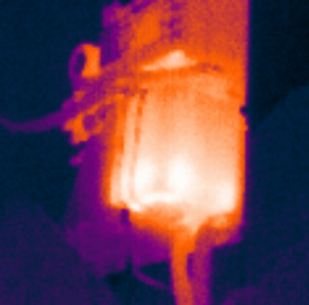 Thermal fuse(s). Protecting from supply and/or relay overheating consequences. Ability to measure temperatures of liable internal overheaters individually. Creepage distances with safety margin and a general HV-LV as well as HP-LP separation. Heat resistant assembly with robust withstanding insulation between HV conductive parts. Standard relay, minimum 10A rated. and with lid on it looks like this. As can be seen, instead of one button and one LED, I've put three LEDs. Robust assembly where the supply module is attached to main PCB by multiple solder points and then main PCB are screwed in place at original fixation points. 5x20mm fuse in semi-covered fuse holder. Divider to monitor internal voltage and detect blown relay termo-fuse. ISP port (needs removal of the nRF24L01+ away from its socket). The +/- of the power module have been shifted. Solve by cutting traces and add jumper wires. The LED transistors (Q2 and Q3) have wrong footprint and must be placed 60' clockwise. The 5x20mm semi-closed fuse holder is placed 1-2mm too south and needs to be trimmed a little on the top edge to fit inside enclose. So put it with the lid hinge in the other end. Fuse value (0.1A) is much too low. Instead I'd recommend a 0.3-0.5A fast fuse. The blue and yellow LEDs are a bit to bright. Increase R4 and R11 some to fix that. The legs of the thermistors and the thermal fuse to the supply must be insulated. Find some suitable wire, strip it off and pull the insulation on to the new parts. And of course: Never ever do anything with 230V connected! Use 12V battery for testing the low voltage sections and functions, and test the high voltage and supply sections separately. I like to use battery instead of 12V supply to avoid risk of ground loop when powering 3.3V through FTDI (from my laptop) at the same time. Start-up inrush current values are presented in the supply review thread. Current measurements at 239V AC: The succeeding "load" inrush current peaks at 15-20mA(rms) for <1s (just by looking at my Fluke). Then a few seconds at 8mA to finally settle at 6.5mA. With pulled relay this is 13.5mA at startup and then settled at 11mA. 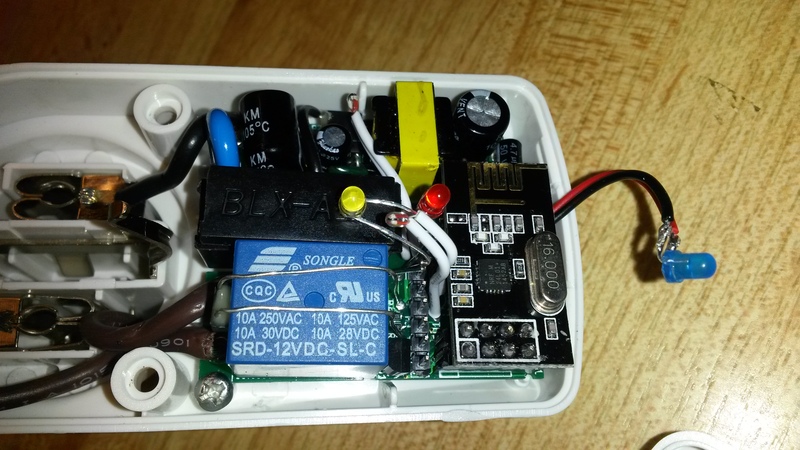 It means 1.5W power consumption at stand-by and 2.6W when relay is on. Ok, I think. Still in the very low load region of the supply load table), which is good according to my EMI guesses/theories in that thread. Load and Temperature: To be able to shoot the thermal images it's necessary to run with open enclosure. In theory, all temperatures will be higher after time in a sealed enclosure. It's anyway good the see how much different parts heat up compared to each other, and during which conditions. First image from one hour at idle. 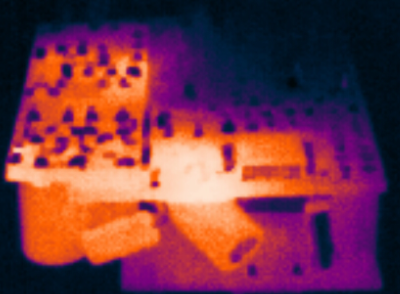 Highest temps measured to be the supply uC and rectifier diode and the AMS1117. All 35-38'C maximum. 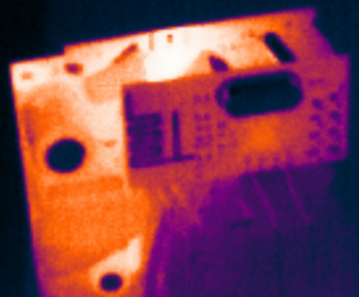 The supply uC heat isn't visible due the thermal fuse on top. Thermal fuses are not (yet) directly attached with thermal paste or glue, but it's on the to-do list. Next to the relay. 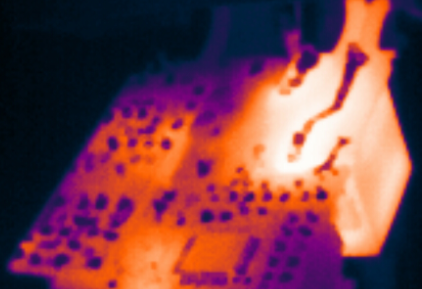 A couple of minutes toggling the relay on-off at 0.5Hz with a 11A (at 239V) resistive load will look like this image below. Max temp ~40'C. 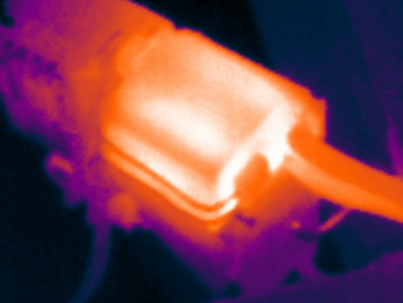 It's easy to see that the heat is concentrated to the south part of the relay and that the thermal fuse is placed very good. I guess an inductive load would be much worse, but I haven't yet got to it. Next two relay images show status after several minutes at a continuous 11A load. Max temp 55'C. This test generated much more heat than the toggle test. Also I think maybe the bottom image illustrates the importance of solder-reinforce the high power traces - there's a lot more heat where I scrimped with solder paste. Here are the controller (Fhem) registrations from the temperature sensors during a test. Plug connected to outlet at 14:00, 11A load is switched on at 14:10 and switched off at 14:17. Clear the board issues above. Attach thermal fuses with thermal paste or glue. Max inductive load endurance test. Build a few more prototypes. Install in "safe places" and set proper controller alarm and measures (back-up switch?). More operation time and collect more statistics. Unfortunately I got stuck quite early at the testing with the 2.0 prototype version. And I don't know when I'll have time to pick it up. If anyone is interested I think it's better to share that design in a separate thread and develop as a fork to the progress of this "test" version 1.0. That's it. Unfortunately I can't estimate any schedule for finish this project, but I've had great fun wiith it so far. Hope you'll enjoy too.